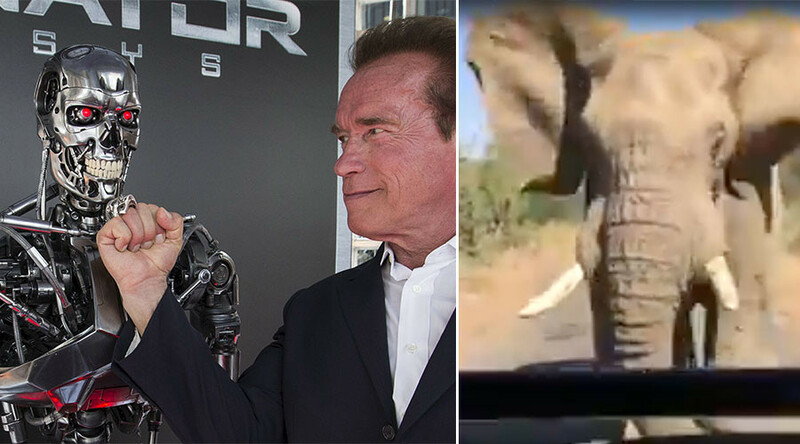 ‘The Terminator’ came within inches of becoming ‘The Terminated’ when Hollywood legend Arnold Schwarzenegger’s jeep was dramatically charged by a disgruntled elephant during a safari trip in South Africa. The former governor of California can be heard shouting “Oh sh*t” as the initially inquisitive animal becomes increasingly aggressive, ultimately chasing the vehicle as it speeds away. It all started with the elephant coming over to the jeep to investigate before nudging the windshield with its tusk. The driver and guide senses the danger but remains calm and warns the elephant – as you do. “No, no, no – you’re being silly now,” he says and turns on the ignition to get ready for the great escape. The elephant then backtracks before circling the vehicle and charging it from behind. Luckily for all involved the jeep is too fast for the animal and the occupants get away. While he didn’t quite say “I’ll be back,” it sounds like The Terminator hasn’t been put off returning for another safari in the future. Meanwhile, the former California governor has refused to openly back presumptive Republican candidate Donald Trump in the presidential election campaign. Schwarzenegger had campaigned for former Republican candidate John Kasich, but would not commit to backing Trump during a Meet The Press interview on NBC this week. When pressed on the issue of backing Trump, Schwarzenegger said he plans to make an announcement about endorsing a candidate just before the election. Instead of committing to a candidate, Schwarzenegger suggested that overcoming bipartisanship is the key issue in US politics, saying that it was only by bringing Democrats and Republicans together that serious issues could be addressed and resolved.